Sustainability is about living in a way that is gentler on the planet, that leaves resources for our children and their children, and that shares resources equitably around the earth, promoting peace. The Stone Church Sustainability Circle meets almost monthly in LIVE AND LEARN SESSIONS, where we learn about an issue together and then share ideas about solutions. All are welcome! Most recent topics include Energy and Food, which involved container gardening, a tour of geo-thermal heat system, and energy saving ideas, a pot luck with all local foods and ways to save energy in our homes. Changed most exit signs in the church to more energy efficient LED signs. Hosted eight different Live and Learn events, with at least 50 different attendees. Developed Market Bucks and continues to support the Huntingdon Farmers Market. Shared skills and food through tomato canning fests each fall. As Christians, we are called to be stewards of God's Creation and to work toward economic and environmental justice for all peoples. The Sustainability Circle aims to support members of the Stone Church community in embracing these calls in our individual and corporate daily living, but providing opportunities to learn about the effects that our choices have, to explore alternatives, and to practice new ways of living (or revive old ones!) - for the sake of Creation and all humanity, present and future. Contact Sharon Yohn (yohns@juniata.edu) OR Laura White (laura.jamie@gmail.com) for more information. 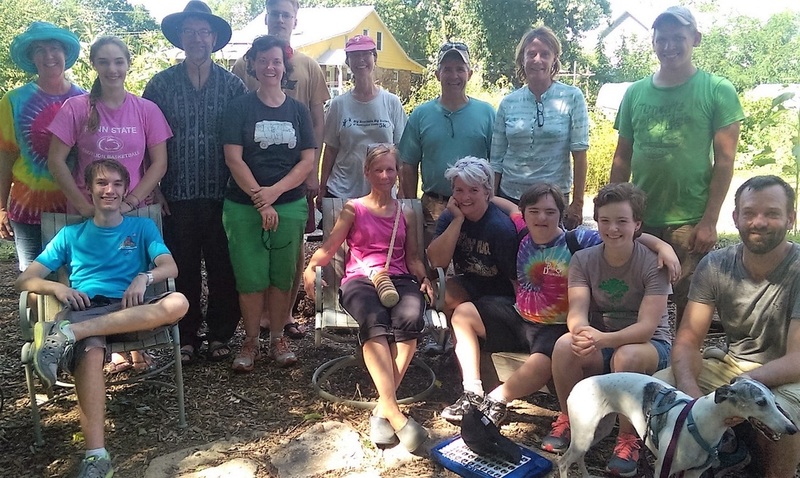 Stone Church sent a Sustainability Delegation to New Community Project's Sustainable Living Center in Harrisonburg, VA to learn about permaculture and healing communities.